Dirty Dangle Hockey: Who's Getting The "C"? After a shortened season with many roster overhauls there were quite a few NHL teams missing their captains when the dust settled. There were captains traded at the deadline, captains bought out, and captains signing elsewhere. Some moves were shocking to see, like noted scumbag Daniel Alfredsson signing in Detroit, while moves like Shawn Horcoff and his $5.5M cap hit getting traded had fans cheering in the streets. In total, there are currently eight teams without captains and they should have some tough decisions to make regarding who will lead their team in the future. Previous Captain and Departure: Jason Pomminville traded to Minnesota April 3rd, 2013. Since Pominville left the Sabres they went with 3 alternates (Stafford, Vanek, and Ott) to finish the season. Vanek and Stafford have been lifelong Sabres while Ott and Ehrhoff just finished their first seasons in Buffalo. Vanek and Ott are UFA's next year and Stafford becomes a UFA in 2015 so giving one of them the "C" might be a tactic to keep them. Worst Candidate: Patrick Kaleta because he's a douche. Previous Captain and Departure: Rick Nash traded to New York July 23rd, 2012. There's some solid choices here in Dubinsky, Umberger and Johnson while Horton is more of a wildcard. Johnson and Dubinsky currently serve as alternates and either recent acquisition would make a great captain in Columbus. Both came over in trades involving players unhappy playing for the team and giving one of them the "C" would certainly take the sting out of playing there. Previous Captain and Departure: Brenden Morrow traded to Pittsburgh March 24th, 2013. Benn, Robidas and Whitney are all currently alternates since the departure of Morrow and all three would be solid leadership choices moving forward. Robidas and Whitney are up there in age and who knows how many years they have left so Benn looks like the ideal choice in our minds. While only 24, Benn has been the Stars best player in recent years and is signed on until 2017. Worst Candidate: Tyler Seguin, although he'd probably throw a sweet party to celebrate. Previous Captain and Departure: Jarome Iginla traded to Pittsburgh March 27th, 2013. Looking at this Flames roster we wouldn't be surprised if they go captainless this year until a player emerges who is worthy of wearing the C.
Previous Captain and Departure: Shawn Horcoff traded to Dallas July 4th, 2013. This is going to be between Eberle and Hall as both are signed long term and the futures of the franchise. 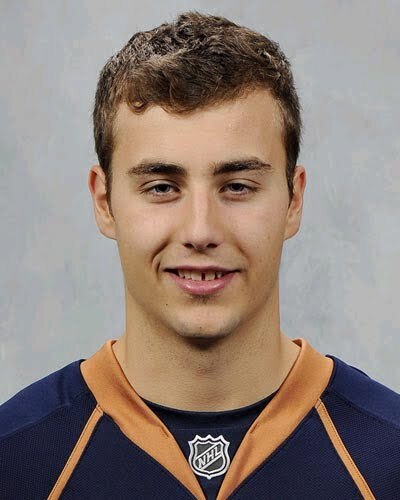 Eberle might not give the best pump up speeches while looking half asleep all the time, so we're going with Hall to receive the C.
Worst Candidate: Nail Yakupov, although it would really piss Don Cherry off. Previous Captain and Departure: Daniel Alfredsson signed with Detroit July 5th, 2013. Phillips as been there since day 1 and even scored the Stanley Cup winning goal in 2007 for the Ducks. Spezza is their top forward, but who knows if his back can carry the weight of being the captain. Karlsson is signed on long term and we really hope he gets it because his pregame speeches with his Swedish accent would be hilarious. Worst Candidate: Chris Neil because he would get more airtime complaining to refs. Previous Captain and Departure: Mark Streit's right traded to Philadelphia June 12th, 2013. I would bet my left nut that Tavares gets the "C" that's how confident I am in this. The Isles franchise player is already one of the top players in the league at age 22 and without him the Isles aren't making the playoffs last season. Moving forward JT will be the pillar of a young, fast franchise that will surprise some people. Worst Candidate: Lubomir Visnovsky, but the irony would be hilarious. Previous Captain and Departure: Vincent Lecavalier bought out June 27th, 2013. All three are current alternates with the team and are signed on for a few more years. The big decision here is do they give it the franchise superstar in Stamkos or the the guy who's been there since 2000 in St. Louis? Our guts say they give to St. Louis until he retires and then hand it off to Stamkos when it's time to give him a contract extension in 2015-16. Worst Candidate: Ryan Malone, just because. I don't really see a reason for Tampa Bay to give it to Martin St. Louis when he is close to retiring.